Nexajoule is developing a patented water cooling unit that we call a 'Sub-Wet bulb Evaporative Chiller' or 'SWEC.' The device is much like a cooling tower, which uses the evaporation of water to chill a stream of water. Unlike a cooling tower, however, the SWEC is not limited by the wet-bulb temperature of the outdoor ambient air. 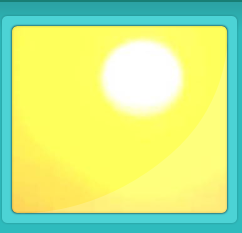 (The wet bulb is determined by weather conditions -- temperature and relative humidity -- and is the lowest temperature that a wet surface will reach based on simple evaporation.) 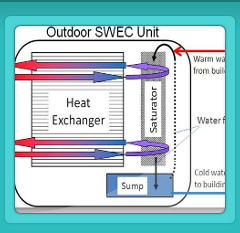 The SWEC utilizes a proprietary heat exchanger that transfers heat from the incoming ambient air to the outgoing chilled airstream. This reduces the wet-bulb temperature of the air that contacts the water stream (in the "saturator"), thereby producing significantly colder water than can be achieved in a cooling tower. In fact, the theoretical limit is now the dewpoint, which may be 20 or 30 degrees F colder than the wet bulb. Colder water allows for increased efficiency and capacity in water-based cooling systems. Testing of an early SWEC prototype at the National Renewable Energy Laboratory demonstrated very high chiller efficiencies, typically 5-10 fold higher than a traditional refrigerant-based chiller, and very good water use efficiency. Nexajoule envisions many applications for the SWEC in water-based (hydronic) cooling systems in both commercial and residential settings. Chilled water can simply be pumped through a hydronic fan coil unit in a forced air system, substituting for or complementing the evaporator of a traditional split-system air conditioner. But an even more cutting-edge application with very high potential energy savings is to couple the SWEC with hydronic radiant systems. Radiant cooling works best using ceiling panels through which chilled water can circulate. People and objects in the room give up thermal energy to the cool ceiling through radiant transfer; latent (humidity) loads can be handled using a small Dedicated Outdoor Air System (DOAS). Radiant cooling is quiet and draft-free, and because pumping water is so much more efficient than moving air, can reduce the energy for cooling distribution 3-4 fold relative to traditional all-air systems. Radiant cooling systems can also utilize warmer water for cooling, thus further enhancing efficiency and enabling the use of evaporative technologies such as the SWEC in a wider geographic range. The same radiant distribution system can be used to efficiently heat the space in winter, perhaps using solar-generated hot water. Incorporation of a storage tank for chilled water enables load shifting to off-peak hours when the power grid is under less stress. Storage also allows the chiller to be downsized because it can operate more hours in the day, and the SWEC can operate during nighttime hours when the ambient conditions are ideal for evaporative cooling. Storage is not an option with traditional air-based evaporative cooling technologies. Nexajoule's past and upcoming projects are aimed at refining the SWEC technology and demonstrating the energy savings of real-world applications. 1) Initial development of SWEC prototypes was funded by the California Energy Commission through the Energy Innovations Small Grant Program under the Public Interest Energy Research organization. Three prototypes were constructed and tested using various design options for the SWEC heat exchangers. Computer models were generated in TRNSYS that allowed hourly predictions of performance throughout the year for a given building application. One SWEC protoytpe was tested at the National Renewable Energy Laboratory's Thermal Test Facility in Golden, CO.
2) Subsequent grant funding from the Colorado Governor's Energy Office allowed for testing of a prototype in conjunction with a forced air fan coil system for cooling of a home. The project provided real-world data on cooling capacity, energy consumption, and water use efficiency. 3) An early SWEC prototype has recently been installed at a Boulder residence for testing in conjunction with the homeowner's radiant floor system. Although floor radiant delivery is not as ideal as ceiling delivery, early indications are that the system is providing adequate cooling with high efficiency. 4) Recent work at Nexajoule has focused on prototype development for a new SWEC configuration that provides a more compact unit with optimized heat transfer surfaces, increased capacity, and reduced water temperatures. Data collection and analysis are currently in progress.